Recent incidents involving raccoons, people, and pets have served as a good reminder to keep the wild in urban wildlife. People are often tempted to feed these cute furry critters by hand, especially in Stanley Park, but feeding them doesn’t help them one bit. When fed by people, they forget how to find food for themselves and come to expect it from people instead. While looking for handouts they can act unpredictably, and in some cases will even become aggressive in order to get some food; biting the hand that feeds it. 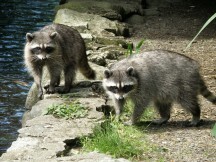 Studies of raccoons in Stanley Park have also shown that raccoons fed by people often suffer from malnourishment caused by the high-calorie, low-nutrient diet that people’s food provides. In addition, by congregating in large numbers in small spaces to feed from a single food source, diseases like canine distemper virus is much more likely to spread from raccoon to raccoon. In some cases, you may be feeding raccoons without even knowing it. Keeping your garbage and compost tightly sealed, and keeping the yard tidy of fallen fruit and vegetables are especially important. One possible explanation for their increased aggression at this time of year is that raccoon mothers have just finished weaning their kits off milk and are taking them out into the streets to teach them how to find their own food. If a curious dog comes sniffing around her kits, a mother raccoon will likely see it as a threat and won’t be afraid to defend them from the biggest dogs and cats. Be careful to keep your dogs on leash and cats indoors, especially at night, and keep a watchful eye out. Also, make sure your dog’s and cat’s vaccinations are up to date as raccoons have been known to carry canine and feline distemper virus, which can prove fatal. Rabies has not been reported in BC in recent years except for bats. If you’ve been bitten by a raccoon, it’s best to visit a doctor just to be sure.